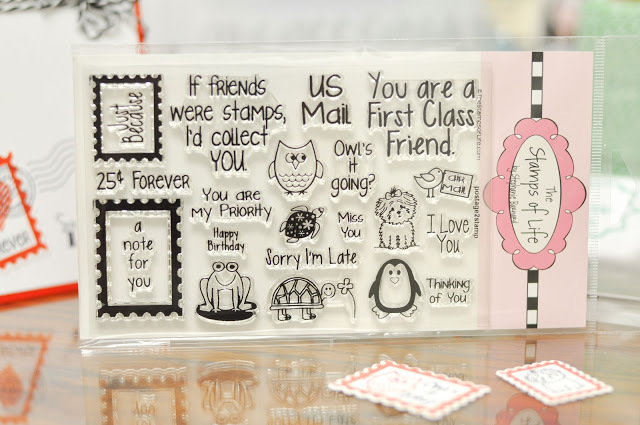 If Friends Were Stamps, I'd Collect You! Here's another card I made recently using my new Postage2Stamp set from The Stamps of Life. I just joined their monthly stamp club. They have some very cool stamp sets and dies. I also ordered the coordinating Postmarks2Stamp set but when I received my shipment, they accidentally included another Postage2Stamp set. Customer Service was great! They told me to keep the extra set as their apology and give it to a friend. How cool is that!!! 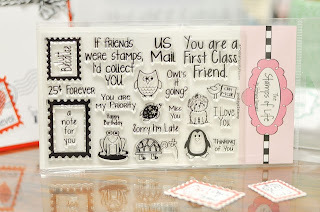 So, one lucky stamping friend will be getting this great stamp set and awesome card! I stamped the postage stamp frames in various inks. The images are stamped in Memento Tuxedo Black and colored with Copics. The top section is embossed with a Tim Holtz vintage postal folder and the edges are inked with Worn Lipstick distress ink. The lower section edges are inked in Tumbled Glass distress ink. I used the coordinating postage dies to cut out the stamps which are secured to the card front with 3D pop-dots.